Nonprofits: does it sometimes seem as if there is a cloud of mystery keeping you from finding out what funders want? All clouds lifted on May 11, 2018 at the Annual Central Texas Funders Forum presented by the Grant Professionals Association – Austin Chapter. Representatives from regional funders were there to answer questions, provide channels of communication and develop ways to work together. The kinds of funders included: private, corporate, and community foundations. There were panel presentations and small group opportunities to ask questions one-on-one. It is conversations like these that help both service providers and funders support the community. Here is a list of grants that Susannah Erler (Director of Greater Good Strategies) has obtained for nonprofit organizations. A Poem and Tip for Nonprofits – All in One! 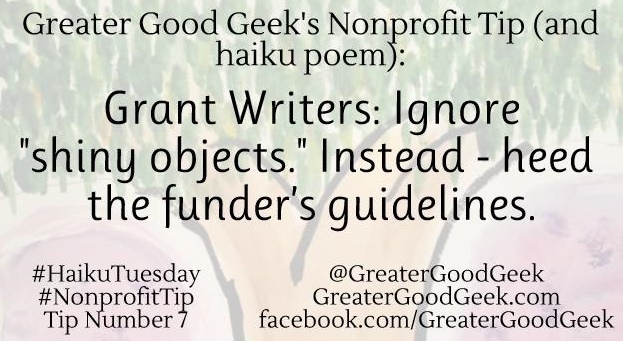 In honor of Haiku Tuesday – here is the latest Nonprofit Tip (and poem) for you. Please enjoy!